From 2000 to 2014, the GM full-sized SUVs (Tahoe, Escalade and Avalanche) were, and still are, the choice of soccer moms, diplomats and celebrities. What makes these vehicles so popular is how they handle suburban and city roads. The key to their functionality is the GM Autoride rear air suspension. Autoride comes standard on the GMC Yukon Denali and Yukon XL Denali. The product is also standard on the Cadillac Escalade, Escalade EXT and Escalade ESV, on which it is known as Road Sensing Suspension. 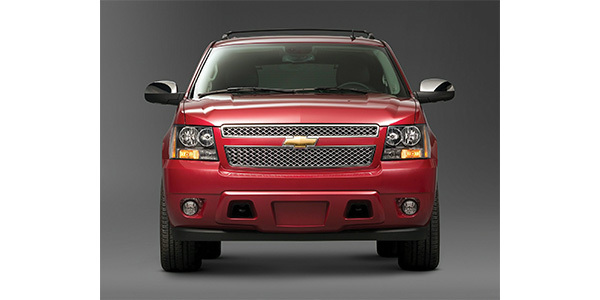 GM also offers Autoride as an option for the Chevrolet Suburban, Tahoe and Avalanche 1500, as well as the GMC Yukon XL 1500. The electronic suspension control (ESC) system independently controls each of the four shock absorbers to control the vehicle’s ride characteristics. The ESC system is capable of making these changes within milliseconds. It uses sensors like the steering angle, pitch/yaw and brake pedal sensors to determine the correct dampening force. The system also uses ride height sensors to determine wheel displacement. 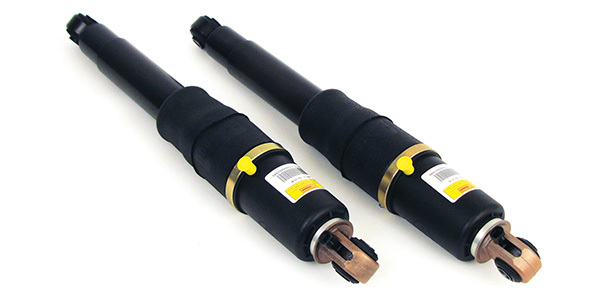 The ESC shock absorbers provide variable damping to resist suspension movement. They have the capability of providing multiple modes or values of damping forces, in both compression and rebound direction. The damping forces are modified utilizing electrical actuators located internally within the shock absorbers. The ESC module has the ability to store DTCs as current or history codes. The system uses an ignition cycling diagnostic approach in order to reduce the occurrence of false or intermittent DTCs that do not affect the functionality of the system. This allows for the fail-soft actions to be taken whenever a malfunction condition is current, but requires the malfunction to be current for a certain number of ignition cycles before the corresponding malfunction code and message will be stored or displayed. The Automatic Level Control (ALC) system maintains a desired rear suspension position under all types of towing, hauling and loading conditions. The system uses the Electronic Suspension Control Module (ESCM) and the serial data circuit to perform the system functions. 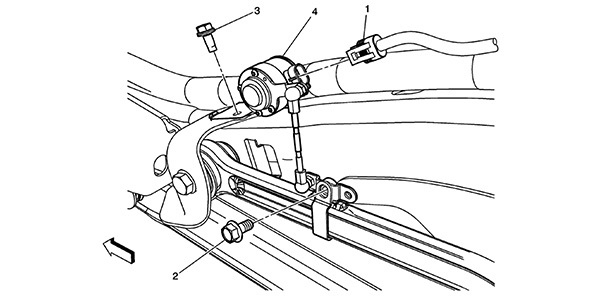 When the vehicle is unloaded, the rear suspension is at a desired position, which is monitored by the ESCM using position sensor inputs. As weight is added to the rear of the vehicle, the position sensor’s signal voltage inputs change. When the ESCM detects a steady, substantial change in the position sensor signal voltages for at least 10 seconds, it responds by commanding the ELC relay ON, which activates the compressor, causing the air pressure in the shock absorber chambers to inflate. This inflation raises the rear of the vehicle to regain the desired suspension position. When weight is removed from the vehicle, the ESCM responds by commanding the exhaust valve ON, causing the air pressure in the shock absorber chambers to deflate. Every time the compressor is activated, the ESCM commands the exhaust valve ON for 1.5 seconds to release air from the compression chamber in the compressor’s cylinder head, ensuring low motor current draw upon compressor activation. The ESCM also limits the amount of compressor run-time to 255 seconds to protect the compressor components from thermal damage. The system also performs a self-test on each ignition ON cycle in which the ESCM commands the ELC relay ON, activating the compressor for 4 seconds, then monitors the position sensor’s signal voltage inputs to verify the compressor is functioning and the system is holding air pressure. 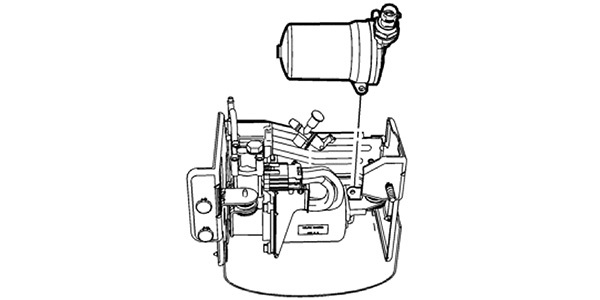 The compressor is a positive displacement piston air pump. It draws filtered air through an intake line attached to an underbody rail. The compressed air is then run through a dryer containing a moisture-absorbing chemical that dries the compressed air before it is sent to the shock absorber chambers. The dryer should be cleaned and serviced during shock or compressor replacement. To service the dryer, remove the compressor assembly from the frame rail. The dryer twists apart and the desiccate beads and filter should be replaced. Service kits are available. If the system is functioning abnormally, performing the Bumpstop and ALC Trimset recalibration procedures may correct the condition. When a system component has been replaced, the Bumpstop setup and ALC Trimset procedures must be performed. Ensure that the vehicle has a full tank of fuel or add sufficient weight to the rear of the vehicle to simulate a full tank of fuel. Place the vehicle on a flat, level surface. Ensure that the suspension is in the normal resting position. With a scan tool, perform the ALC Trimset procedure by following the screen prompts. With a scan tool, perform the suspension Bumpstop setup procedure by following the screen prompts. Once the process has been completed, the system should be fully functional. Pressure checking the integrity of this intelligent air ride system requires more than just soapy water. To isolate a leak, the system must be at pressure. Since the system has solenoids, leaks may not be spotted until that circuit has been pressurized. Disconnect the air tube from the air dryer. Attach the air tube to the pressure gauge on the side opposite the toggle valve. Apply service air pressure to the service valve and pressurize until the pressure gauge reads 550 kPa or 80 psi. Verify that the system maintains pressure for at least one minute. If the system does not maintain the specified pressure for the specified amount of time, check the shock absorber air sleeves, air tubes and all connections for air leaks using a soapy water solution. Repair or replace any leaking components. There are three replacement options when it comes to a GM Autoride System. First, the owner can return the system to like-new condition by having the broken components, like the active shocks and compressor, replaced. Second, the active shocks can be replaced with passive units while still retaining the air suspension function. Third, the Autoride shock can be replaced with a passive conventional shock and a new spring can be installed. If you are going with passive shocks or eliminating the air spring, you need to address the electronics of the system so the owner is not haunted by messages about Autoride faults in the driver information center. If only the rear shocks are being replaced with passive units, most kits will include a bypass that simulates the resistive value of the actuator for the active dampening. If the vehicle is being converted to conventional springs, the electronic suspension control module must be bypassed. The bypass allows the CAN Bus signals to pass through the connector to the next module on the loop. 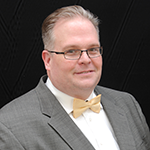 No matter the solution, consult your customer about the pros and cons of each option. By eliminating the Autoride system, you are changing how the vehicle handles and rides, not to mention altering the towing characteristics.